Indigenous Water Filtration Technique in Rural Areas of Assam: A Study on Iron Removal by Bamboo Charcoals, 2012. Bhupen Kumar Baruah, et al. Deterioration of groundwater quality due to geogenic and anthropogenic activities is now a serious issue all over the world. Evidences of contamination of groundwater resources prevail in many areas of India, particularly Assam. 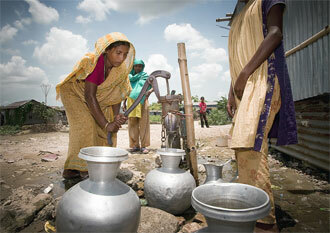 More than 80% of the rural population of Assam depend on groundwater resources for drinking and irrigation. The iron quantity in the groundwater of Assam is found to be between the desirable to permissible limits almost throughout the state. Iron, the common household water contaminant, has no direct health effect at concentrations generally found in groundwater. But high concentration causes staining, offensive taste and odor. The rural population of Assam frequently use sand, pebbles, charcoal and lime in their common water filtration technique for water purification. A study was carried out on the common indigenous water filtration technique using four different bamboo charcoals (Bhaluka, Jati, Makal and Bijuli) separately for iron removal. The study reveals that all the four types of bamboo charcoal could effectively remove iron from water. However, charcoal from Bambusa balcooa (Bhaluka) is more capable of decreasing the iron levels to desirable limits. Good day! I was wondering on how they use lime as a component in filtering their water? It’s just that I am searching information about different types of water filter that I can use in my research and I came across this. Thank you.